Last weekend was St. Patrick's Day weekend, and typically everybody in New England clings to their Irish roots, no matter how small, and goes out to see any band that also has any Irish roots they can cling to. It was refreshing to see how many people went out to The Strand Ballroom on Saturday night to take in the gypsy/Latin punk hybrid of Gogol Bordello. Those that did were treated to one of the best shows I've seen in years. I had been trying to get out to see Gogol Bordello for years, ever since their stripped down performance at the Newport Folk Festival in 2011. I've wanted to see a full band set from them, but it just never has worked out for me. This week I had a close friend in from out of town which inspired me to finally pull the trigger and do it. I couldn't be happier that I did. 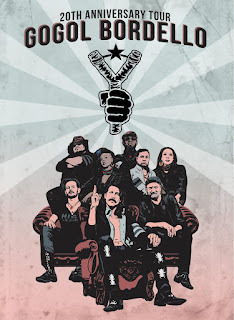 I had ridiculously high expectations, since Gogol Bordello was one of the highlights of that year's NFF, a year that included The Decemberists, Emmylou Harris, Elvis Costello, Wanda Jackson, Mavis Staples, Tegan & Sara, Justin Townes Earle, David Wax Museum, etc. It's hard to stand out on a bill that stacked, but Gogol Bordello shined. Saturday night was a truly epic performance. Playing for two hours, Gogol Bordello played literally every song we could have possibly wanted. They broke out "Not a Crime" and "Immigrant Punk" early in their set, and even played their most popular song, "Start Wearing Purple," much earlier than I would have expected. They also broke out covers of The Cramps and Iggy Pop halfway through the set. It's rare that a punk show is fueled with as much joy as a Gogol Bordello show is, but that's one of the things that separates them from the rest. That joy extended to the crowd, which was rowdy but never crossed the line into violence (except for one guy who was kicked out for fighting). Given the current political climate, and the fact that the band waves their immigrant status quite proudly, there weren't any political statements between songs. Instead, the band let their music do the talking for them. Nu Folk Rebel Alliance opened the show. They were a duo performing mostly Clash covers in a Latin/hip hop/folk style with pre-recorded drums. It might sound like an odd choice, but then you must have never listened to Sandinista! It was a perfect choice, and I'm hoping to stumble across them again soon.